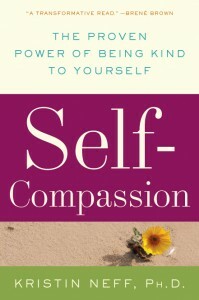 I read this book as part of a self-compassion reading/discussion group. We had already read through Christopher Germer’s The Mindful Path to Self-Compassion: Freeing yourself from destructive thoughts and emotions together, so I had a fairly good idea about what to expect. Even so, I found discussing a multi-layered/faceted topic such as mindful self-compassion as part of a group really beneficial. Both books were easy to read, however it was great to have a supportive network of people to share my thoughts with. When reading thought provoking books my system is to highlight good points and use sticky flags for great points. I’m pretty certain that 40-odd sticky flags is a sign of an engaging book littered with gold nuggets of truth and wisdom. One such nugget is the notion that while pain is a part of the human experience, suffering is something we choose. Attributed to meditation teacher Shinzen Young, this idea is often represented as a formula: suffering = pain x resistance. Neff explains that ‘our emotional suffering is caused by our desire for things to be other than what they are.’ It’s a rare person who is able to sit with their pain without a) trying to avoid it or b) becoming overly attached to it, but this is the essence of mindful self-compassion practice. As you would expect, Neff discusses the components of mindful self-compassion (kindness, common humanity and mindfulness) as well as how mindful self-compassion differs from self-esteem and self-worth. Additionally, she tackles topics like isolation and interconnectedness, compassion for others, intimacy and parenting. Neff uses interactive exercises and realistic examples, but what sets this book apart is the author’s willingness to share her personal journey with the reader. For me, this unexpected gift really emphasised the common humanity aspect of mindful self-compassion. I found myself looking forward to reading each instalment of Neff’s story not just because it was interesting but because it was heartening to know I wasn’t the only one struggling. Suffering has an amazing way of narrowing our worldview and isolating us from those around us. Being mindful about who we are in the world and treating ourselves with kindness in the face of pain is the antidote to that. Neff’s book – and indeed her whole volume of work on this emerging perspective – is a gift that won’t stop giving. I thank her for that.